Posted by skyvu on Monday, July 23, 2018 in News, Procurement. We are excited to announce some upcoming changes to our Procure-to-Pay processes. 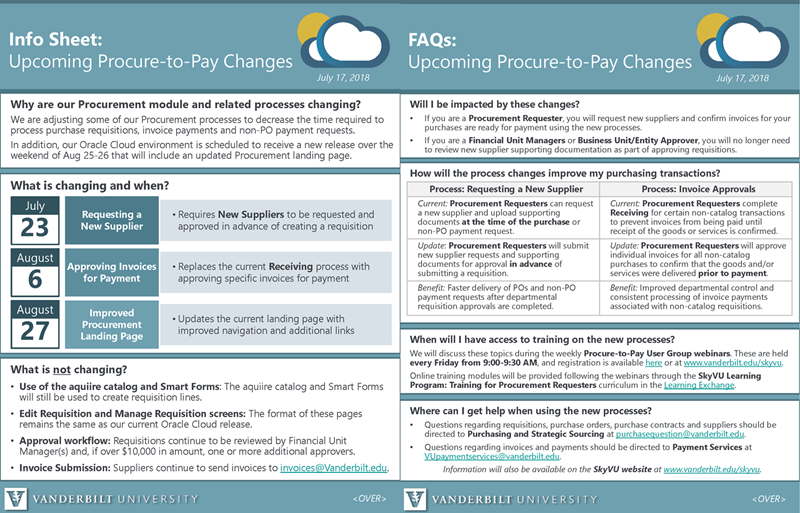 Vanderbilt is implementing these updates to decrease processing time for purchase transactions, no-PO payment requests and invoice payments. Procurement Requesters should attend the weekly Procure-to-Pay User Group webinar (click here to register for this series) and complete the related online modules in the SkyVU Learning Program: Training for Procurement Requesters curriculum in the Learning Exchange following the webcasts. Recordings of past webinars are available through the Calendar page of the SkyVU website.